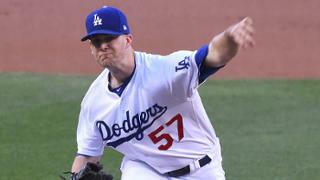 Alex Wood pitched seven shutout innings in which he allowed only three hits and struck out ten batters, leading the Dodgers to a 1-0 win over the Diamondbacks. Wood now has a record of 10-0 and is the first Dodger starter since Don Newcombe in 1955 to start a season 10-0. Yasmani Grandal provided all the run support on Wednesday night with an RBI double in the second inning. For some reason, Alex Wood was not selected to pitch in the All-Star game. This, however, did not affect him on Wednesday night as he shut out the D-backs over seven innings. Wood went to the mound as if the game was his last game. When he got into a jam in the fourth inning he used a strikeout to get out of it. Later, when he got into another jam in the sixth, he stayed calm and recorded the last two outs of the inning. The Dodgers provided just enough run support for Wood, not too much and not too little. In fact, the only time the Dodgers scored a run was in the second inning. Zack Godley was the pitcher for the D-backs and he got Joc Pederson to ground out to open the inning. Chris Taylor then singled, bringing Grandal to the plate. The first pitch Godley threw was a sinker over the heart of the plate. Grandal lined it to left-center field and the ball rolled to the wall. Grégor Blanco and Chris Herrmann both tried to pick it up. That resulted in them dropping the ball before Blanco managed to pick it up. This allowed Taylor to continue running and he scored without a throw, giving the Dodgers a 1-0 lead. For Godley, it was the only run he allowed in 5.2 innings but it proved to be one run too many. Over 5.2 innings, Godley was charged with one earned run on three hits with one walk and six strikeouts. The D-backs were unable to provide any run support so Godley was charged with the tough-luck loss. A day after Kenley Jansen gave up a three-run home run to Daniel Descalso, Jansen recorded the save, preserving the Dodgers’ 1-0 win. Jansen got Chris Owings to fly out, then he struck out Jake Lamb. Brandon Drury then hit a single to center field. Jansen then struck out Herrmann to earn the save and preserve the win for Wood. Justin Turner went 1-3 with a double as he continued his case for the All-Star Final Vote. The final voting ends today at 1:00 pm PT so be sure to vote for Turner. Use #VoteJT on Twitter. Every Tweet with the hashtag will count. You can also text “N5” to 89269 a maximum of 35 times. The final way you can vote is with the All-Star Final Vote. Robbie Ray will take the mound for the Diamondbacks in an attempt to get Arizona a win in the series and Rich Hill will look to lead the Dodgers to a series sweep of the D-backs. In five career starts at Dodger Stadium, Ray has a record of 1-2 with an ERA of 2.32. Rich Hill is coming off his best start of the year and Dodger fans are hoping to see the same level of dominance. He pitched seven scoreless innings against the Padres and struck out eleven batters. In his last start against the Diamondbacks, Hill lasted only three innings due to blisters on his throwing hand. The game will start at 7:10 pm PT and be televised on SportsNet LA.